Unexpected weekend sunshine sent us on a road trip north of Juneau to a little beach near Sunshine Cove. We sat several hours on a rocky outcrop, watching and listening to the abundance of the wakening northern world. 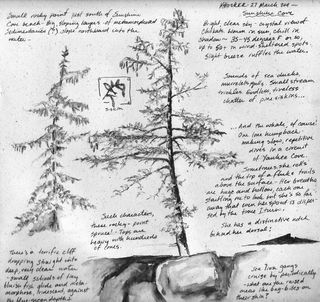 I took the opportunity to practice drawing the textures of foliage on the little salt-battered shoreline spruce. Spent a very pleasant last weekend in Sitka, participating in the annual Arti-Gras festival. I taught a couple of workshops. 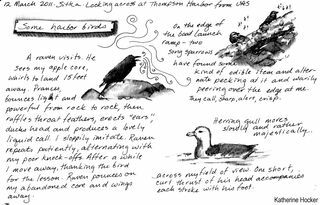 I didn’t do much sketching on my own (mostly just demos for class) but I did spend one lunch hour watching birds at Thompson Harbor, resulting in this little memory page. As always, Sitka was lovely and lively. 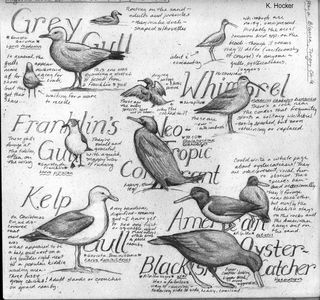 It was a special pleasure to spend time with two wonderful Southeast Alaska naturalists and bloggers, see their blogs:here and here. Just got back from a vacation on the island of Hawaii (Big Island). Being ocean people, we spent most of it in the water or directly adjacent. One of the loveliest places we visited was Pu'uhonua o Honaunau National Historical Park, south of Kealakekua Bay on the west coast. 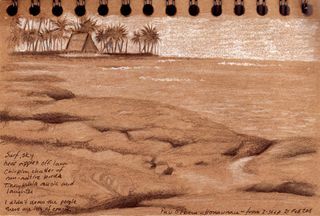 Spent the morning alternately snorkeling and sketching, looking across the lava shelf to the serene palms of the park. 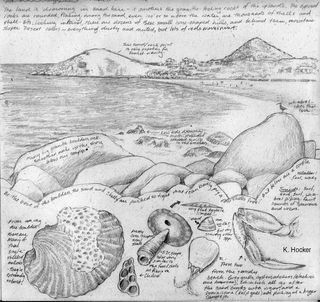 Here's a page of sketches from my recent stay in Seldovia, where I spent a couple of wonderful weeks as artist-in-residence. The school is very small (50 kids K-12) so I got to work with every student, every day.Great kids, great teachers, great staff, nice community… thanks, Seldovia! One evening, I walked out the "Otterbahn" trail (constructed by a group of high school students in the 1990s, I think) to a small beach. 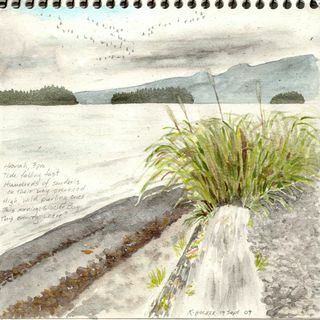 As I settled down to sun and sketch, I heard harlequin ducks making agitated noises. The ducks huffed and squeaked, then finally took off just as a big otter rounded the point. He climbed ashore, shook himself off, and proceeded to entertain me for about twenty minutes, as this page attests. I've been busy on artwork lately–but not sketching. Here's the result. 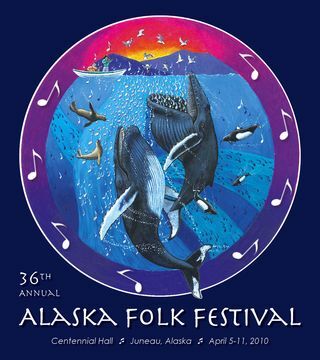 This is my second poster for the Alaska Folk Festival. Now that it's done…I'm back to sketching soon! And I'll put in a plug here for Jaramillo's terrific book Birds of Chile. Great illustrations, well-written, easy to use. We just returned from a 3-week trip to Chile, so I'll post the results here over the next couple of days. The first is a page from Playa Blanca, a little resort beach south of La Serena. It was a lovely spot, great for lazing around, exploring desert and coast, and sketching. Our condo unit was just above the boulder beach in the foreground here, so we were soothed by the roar of the surf day and night. At dawn, whimbrels and oystercatchers piped their calls into the wind. Spent yesterday in Hoonah at what used to be Cannery Point; now a tour destination with restored cannery buildings housing cafes, exhibits, and souvenir shops. It was warm for September, with cloud-chased sunshine and occasional stutters of rain. Port Frederick was so calm, so quiet that we could easily hear the breath of a lone humpback whale in the distance…and, every so often, the thrilling calls of the sandhill cranes skeining overhead.